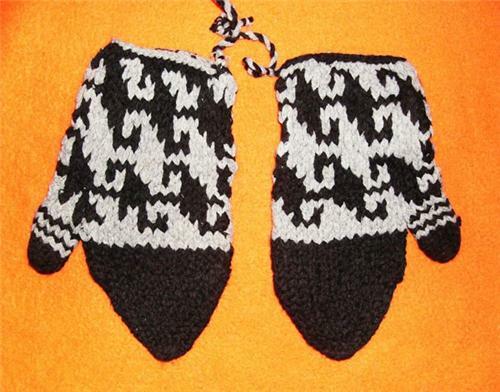 These Mittens Come In A Variety Of Colors And Patterns. We Choose For You! Hippie clothes. Bohemian clothing. Artsy clothing for expressive people These are traditional knit mittens handmade by artisans in Pakistan. They are made of a WOOL and RAYON blend, ultra soft and warm. Very comfy. The addition of rayon to the wool cuts down on the itch some people experience with wool.These mittens are so charming with their handmade look and cozy feel. You will wish you knit them yourself! Because these mittens are handmade in Pakistan there are inconsistencies common with all handmade items. These imperfections only add to the charm of wearing hand-knit clothing. These mittens are made of recycled materials and as such there might be discolorations on the yarn or irregularities to the weave common of recycled fabrics. Sometimes the colors of one pair of these gloves may differ slightly than the other. For example, one mitten may contain a few rows of one color that the other does not, or the background color may be slightly different in weave and color in both gloves. This is because they are made of recycled materials and the yarns are all different. Also these mittens are hand-tied and therefor there are knots in the mittens where new yarn is added. These knots can be slipped under to hide them. If you have sensitive hands these knots could bother you. Please be aware of this when making a decision to buy. These mittens are NOT like getting something factory made in the US. Because of the handmade nature of these items, size varies. The measurements here represent an average measure of this item. Please keep this in mind when ordering. Check the measurements below. Unless otherwise stated glove measurements are taken flat unstretched and NOT doubled.